Happy Tuesday Doodlebug friends! It's Traci, and I'm so excited to be sharing a new mini album with you today! 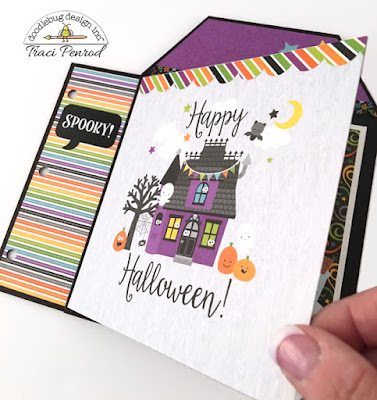 Last year I created a similar Halloween house album for my Artsy Albums kit shop, and I was looking forward to doing another one this year. 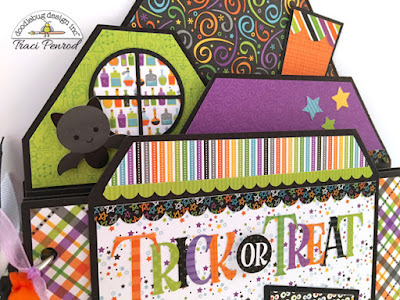 Boos & Brews is perfect for this project with it's colorful patterns and so many cute embellishments! I designed the album on paper and cut it out of heavy black chipboard. 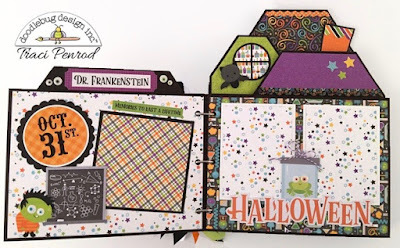 Then I layered the pieces with pattern papers from the 6x6 paper pad and 12x12 sheets. That swirly paper on the roof is one of my favorites!! It makes it look like magic is swirling out of the house. And that little scientist! I added eyeball sprinkles to make him look just a little more wacky. 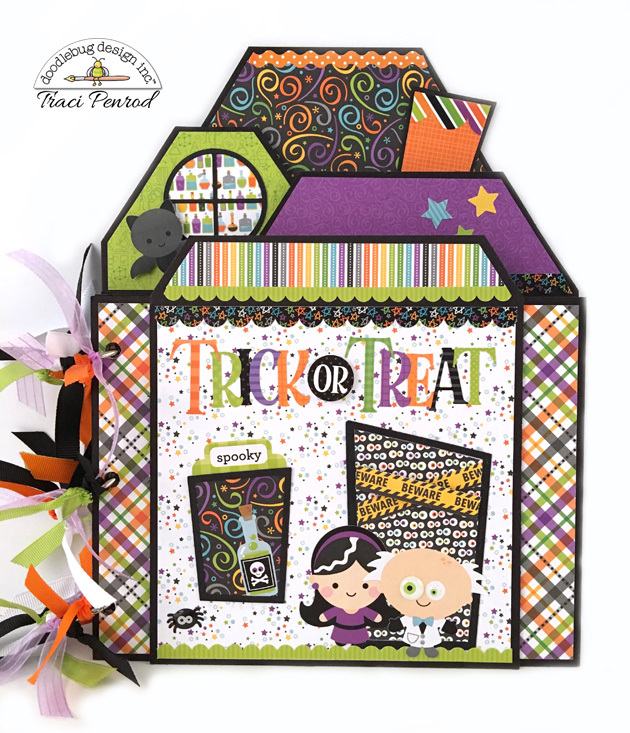 This cute page was made from a 6x6 sheet ... I used it to create the front of a fold out card that will have photo mats tucked inside. How cute is this little one-eyed green guy!? I combined him with a green drippy border punch and added a green splat from the odds & ends to complete the page. He also got an eyeball sprinkle -- love those! These adorable frames are from the odds & ends and the stickers are from the icon and This N That sheets. 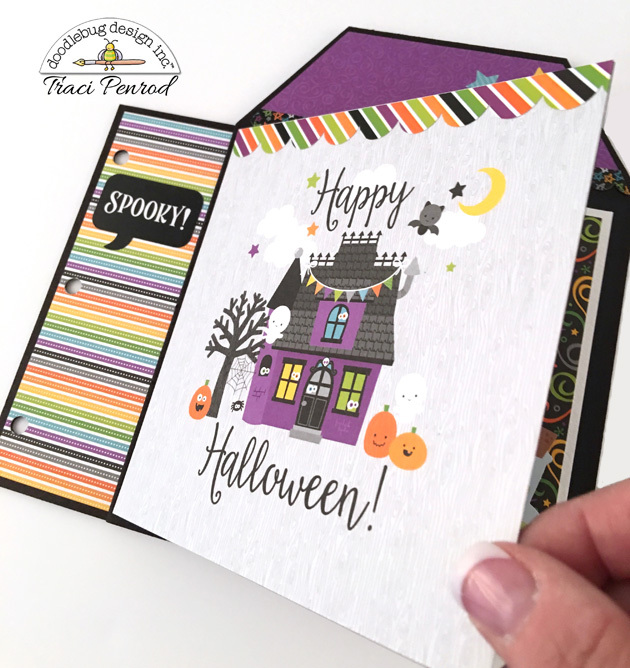 I just love that little ghost! This album will also be available to purchase as a kit. Details can be found on my blog at Artsy Albums. 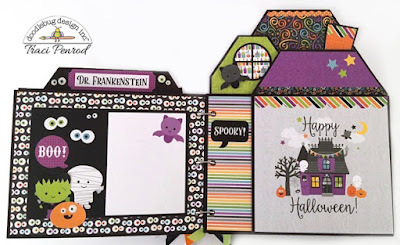 I hope you have fun creating some spooky fun projects with Boos & Brews! This is so cleverly put together, Traci! Love it!!! Explore the new trend in daily investing of Binary Options for the on-the-go investor. Trade from anywhere, at any time, and with any mobile smart phone. Simplicity and speed of trading is the key to making your trades wherever you are. Adorable from beginning to end! Love it!